Nissan's new passenger van is 23.9 inches longer than a 2012 Ford E-350 Super Duty regular length model, which also seats 12. Early this year Nissan introduced a full-sized commercial panel van that's offered in two flavors -- standard and tall; as in, you can walk around the interior. So it was just a matter of time until Nissan targeted the hotel shuttle and church bus crowd with a windowed passenger model using that platform. First impression is that Nissan's windowed van is a very credible competitor for a segment that has been dominated by the Ford E series and the Chevrolet Express, and to a lesser degree by the GMC Savana and Mercedes-Benz and Freightliner Sprinter. Nissan's new model is called the NV3500 HD Passenger Van -- it seats 12, is offered with a V-6 or V-8, and will be available at about a third of Nissan's dealerships in the spring. Nissan introduced the van at a press event in Detroit on Tuesday. And while Nissan did not talk about pricing, the van might have a price advantage because the standard engine has six-cylinders, vs. eight in the Ford and Chevy. A diesel is not offered. The passenger van is based on the standard commercial van. Hotels wanting a tall, walk-around model will need to search out converters. The van's shape takes a little time to get accustomed to. The vehicle has a long nose; Nissan essentially took a Titan pickup cab and added a long box to hold passengers. The Ford and General Motors models have a considerably shorter nose because the engine is positioned closer to the driver. Nissan says the downside of the Ford and GM configuration is that engine noise and heat is closer to the passenger compartment. There was no opportunity to drive the Nissan vehicle to check those levels. Of course, the longer hood for the Nissan model has its own potential shortcoming, meaning parking. The Nissan model is 23.9 inches longer than a 2012 Ford E-350 Super Duty regular length model, which also seats 12. While Nissan expects the majority of its passenger vans to serve as hotel and parking lot shuttles, 15 percent are expected to end up with retail customers. Among the available features for that crowd are leather seating surfaces, navigation system, XM satellite radio and rear-view camera. Nissan won't predict sales for the passenger van. Last year Ford sold 23,799 Club Wagons, the E Series model with windows, plus 84,459 panel vans, for a total of 108,258. Nissan did not sell any full-sized vans last year. Sales began this past spring, and through October Nissan has sold 3,976 panel vans. How big is the market? Last year, the industry sold 190,765 full-sized vans (panel and window versions combined), a 20 percent increase from the previous year. Sales are up 18 percent for the 10-month period this year over 2010. Nissan gets a thumbs-up in terms of safety. Headrests are standard for all seating positions, and side curtain air bags are standard for all four rows of occupants. Chevrolet, GMC and Ford do not offer these features. Additionally, integrated seat belts are standard for all rear seating positions. That means there are no belts hanging from the ceiling or attached to an interior panel. Instead, each belt is incorporated into the seat. The van's second, third and fourth row seats are removable, and Nissan claims 324 seat configurations. And here's another thumb's up: A common-sense solution for the fourth row beach seat. Nissan has a 50-50 split seat for the fourth row, which makes removal easier. It takes two adults to remove the heavy, bench seat in some other full-sized vans. In terms of power, two engines are available: a 261-hp double-overhead cam 24-valve 4.0-liter V-6 with 281 pounds feet of torque and a 317-hp 5.6-liter double-overhead 32-valve V-8 with 385 pounds feet of torque. Both engines have continuous valve timing control and are matched to a heavy-duty five-speed automatic transmission. A 28-gallon fuel tank is standard. Miles per gallon is not reported for vehicles having a gross vehicle weight above 8,500 pounds. 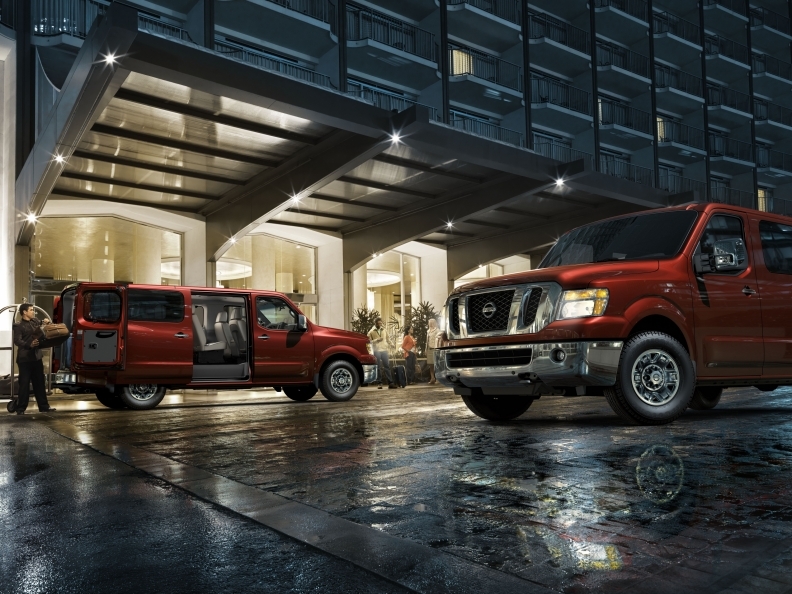 The Nissan NV3500 HD will be assembled in Canton, Miss., and will be available at certified Nissan commercial vehicle dealers. I can't remember the last time an automaker called a press conference to introduce a completely new van. A Nissan executive said the automaker spent more time researching the van segment than the market for any other model it developed for the North America. Simply, Nissan did its homework, especially on the safety side.